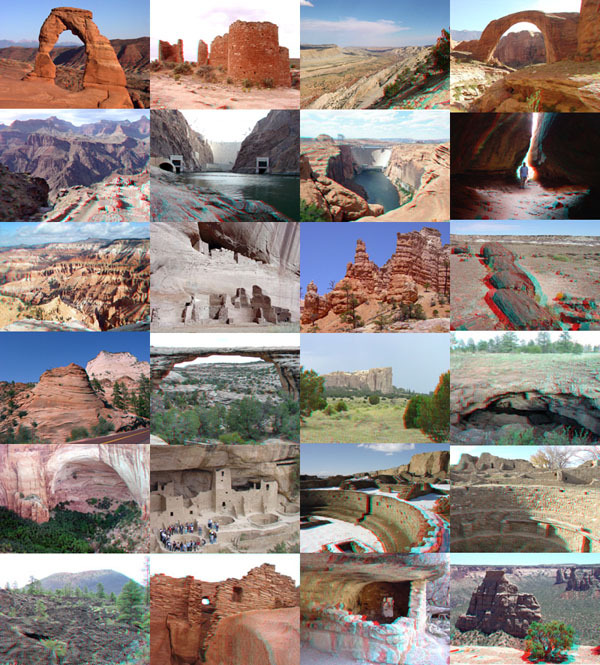 Click on a national park below to start an image tour. Or, use a Location Map, Thumbnail Gallery index, or selected Subject index. Standard photography websites mirror the 3D image websites. American Indian Indians of the Southwest, 1871-1975: a 3D Image tour of Early Photography Taken During the U.S. Geological and Geographical Surveys West of the 100th Meridian and the Powell Survey of the Colorado River Canyons. The 3D images are anaglyphs and require red and cyan 3D viewing glasses. These full-size images average 500 KB each and may be slow to download. A search on the World Wide Web will yield many sites about anaglyphs and where to get 3D glasses. To learn more about how anaglyphs (3D images) are made, click here. Click here to see historic 3D photography of the Powell Survey Expeditions (1871-1872) of the Colorado River Canyons. Also see historic stereo images of American Indians of the Southwest, Yellowstone, and Yosemite. 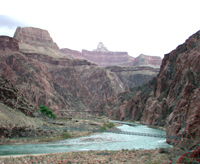 Take a virtual hike or take a raft trip to the bottom of the Grand Canyon! Animals, vegetables, minerals, and more! Additional parks and resources are added to this website as they become available. All color photography on this website was taken by Phil Stoffer unless otherwise stated on the image caption text. All images are "public domain."